The festival features three two and a half hour workshops from 10:00-12:30. These will be led by Grevel Lindop, Kate Foley and James Knox Whittet. All our experiences happen somewhere; we become part of places, and they of us; we have childhood memories of rooms, gardens, school playgrounds – they may be lovely or frightening, or contain mysteries we never quite solved. And then there are the places we imagine, or the places we go in dreams. The workshop will explore the different places, actual and imaginal, that are meaningful to us; look at how we can evoke, structure and explore them in poetry, and at how the shape and sounds of the poem itself can form a ‘music’ to invite the reader into those places which are, ultimately, inside ourselves. How can we best pack the concentrated essence of poetry into a parcel that begs to be opened? It’s as if dead live on in inanimate objects which their hands have smoothed and moulded through constant use. I think that almost everyone has been left with certain possessions whether it be a piece of furniture; a garden spade rusting in a shed or an ornament or piece of jewellery, however inexpensive, which conjures up a particular person and a way of life that has seemingly gone. The purpose of this workshop will be to explore ways in which certain objects can hold within themselves an imaginative key to open up the past. From 13:00-16:50 Suffolk’s Poetry Cafés will provide the entertainment. There will also be two close readings from Michael Laskey. Open Mic is 16:50-17:30. Book up when you arrive. At 18:45-21:30 we turn to the invited readers and guests. From SPS we have Pam Job and Rob Lock. We continue with a talk from Antony Johae Lebanon: Poetry and Place, followed by six poems by James Knox Whittet from a song cycle Islands of Love set to music by Colin Whyles and performed by Lynne Nesbit and Colin Whyles. We end the day with our guests Kate Foley and Grevel Lindop. Ticket prices are discounted for SPS members and also according to how many parts of the day you choose. Tickets cost between £7.50 and £22 for non-members, and are available from the Suffolk Poetry Society website. 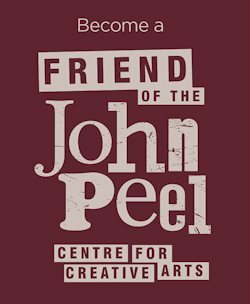 Please note that this event has not been organised by the John Peel Centre, and as such all aspects are the responsibility of the Suffolk Poetry Society.